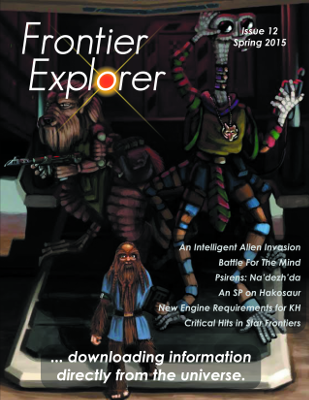 Issue 12 of the Frontier Explorer is now available. This issue is all about psionics. We have a variety of articles on mentalist powers, equipment, creatures, and a new alien race by Laura Mumma, an author making her debut contribution to the magazine. I think you'll really enjoy the race she's invented. In addition to the mentalism articles there are a variety of optional rules articles covering spaceship construction and critical successes and failures. Additionally we have an adventure set on Clarion, a short review of another old sci-fi RPG, our usual comics, and an analysis of what Gandalf the Gray would look like in the Star Frontiers setting.